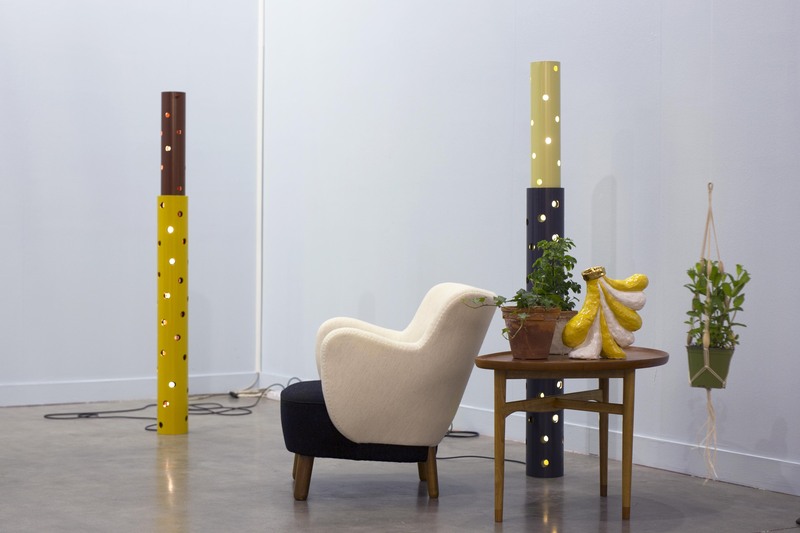 Through a juxtaposition of Danish Modern design and contemporary art, Galleri Feldt’s contribution to MiArt 2018 presents a meditation on the tension, inherent to the process of design innovation, between the weight of tradition, the desire for individual expression, and the imperatives of functionality. 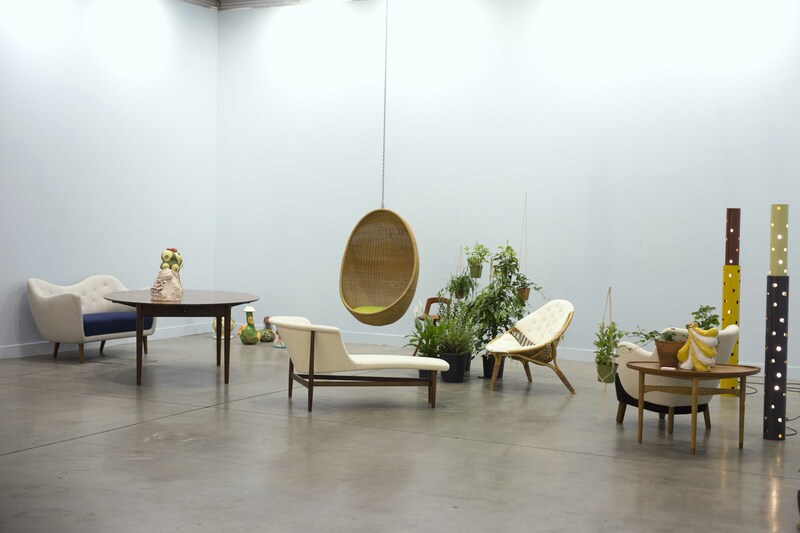 Each work included in the installation—an ensemble including pieces by Nanna Ditzel, Leonor Antunes, Tove and Edvard Kindt-Larsen, Finn Juhl, and Nico Ihlein—is a unique balancing act of these three forces, and the way in which each creator mediates between them is a microcosmic lesson in design history. By exhibiting works that span 20 years of Denmark’s Golden Age of design, the installation aims to give a sense of the varied creative landscape within which designers could reinvent themselves from piece to piece, but also of the sense of harmony they cultivated in the collective pursuit of a singularly warm type of beauty. At the same time, including non-Danish, contemporary pieces in the installation allows for a welcome formal and conceptual contrast, opening an aperture to different, even more intensely personal forms of design expression. 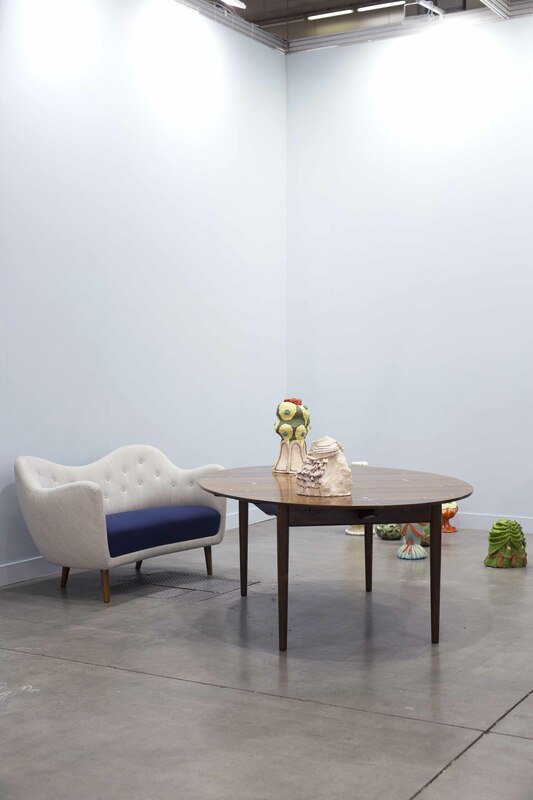 The soft lines of many of the Danish pieces displayed in Galleri Feldt’s Miart 2018 booth create a miniature landscape that is cast against a very particular background: the greater Danish aesthetic tradition, spanning back to its Golden Age of painting in the early 19th century, as symbolized by the blue color that decks the booth’s walls. This blue is the same soulful yet intense, mild yet bright, hue that the painter C. W. Eckersberg (1783-1853), considered by many to be the Father of Danish Painting, used to create a recognizably Danish sky in his many plein air and maritime landscape paintings. The color has become iconic in Danish art history, a token of Eckersberg’s—and, by extension the Golden Age’s—precise yet understatedly idealized depiction of nature. It is the product of the painter’s careful study of light and meteorology (for many years he kept a weather journal in which he recorded daily meteorological conditions), together with his insistence on maintaining harmony in his compositions. By alluding to Eckersberg’s artistic practice, Galleri Feldt suggests that Danish design is anchored in a long tradition, one that has always been attuned to the world’s practical realities, but that has also insisted on responding to it with a certain amount of aesthetic idealism. The earliest piece presented in the booth is Tove and Edvard Kindt-Larsen’s 1938 easy chair, created for cabinetmaker Gustav Bertelsen, upholstered in Beech and Savak fabric designed by Tove Kindt-Larsen. With its rounded, sculptural form and structural contrasts, the chair was a departure from the more reduced forms of Functionalist design promulgated by the Kindt-Larsens’ mentor, Kaare Klint (1888-1954). It was the bicolored upholstery in particular, heightening not the chair’s functionality but its playful character, that attracted attention and that led one critic to call the chair “a hitherto unforeseen creature.” The chair’s difference from the norm was characteristic of the Kindt-Larsens’ understated rule-breaking, and their original choices paved the way for many other creative designers in their wake. Framing the Kindt-Larsen easy chair are two Olga lamp by Leonor Antunes, produced for Galleri Feldt in 2016. In creating them, Antunes was inspired by Modernism at its most industrial, but she wielded it to achieve an intimate portrait of a relationship. The lamps are composed of two metal tubes—one tall (167 cm) nested inside a shorter one (100 cm)—the dimensions of which were determined by the respective heights of Antunes and her daughter, Olga, who was 6 years old at the time of the lamp’s making. The technical performance of measurement and the structural simplicity of the tube thus carry intense emotional resonance that is further accentuated by Olga’s mode of functioning, which gives light through perforations that dot the tubes irregularly, and allows the outer tube to be shifted so that the holes may be aligned to varying degrees. The act of adjusting the light, then, creates a twinkling effect that reflects the dynamic interdependence of the mother-daughter relationship. Antunes’ creation is as much a self-illuminating sculpture as a space-illuminating lamp, and as such, it is perhaps the installation’s most concise embodiment of the tension between individual expression and functionality. Nanna Ditzel’s chaise lounge in Brazilian rosewood and wool upholstery, a unique piece designed for the 1951 Copenhagen Cabinetmaker’s Guild Exhibition at Designmuseum Danmark, is an example of resistance to industrialized efficiency, here driven to its practical limit. Galleri Feldt’s prototype never made it to manufacture, and we can only surmise the reason: curvaceous, complex, and entirely hand-made, the design was too expensive to produce at a profit, so the piece remained in private obscurity for decades. Its singular nature, created almost to spite the notion of functionality in favor of its creator’s individual vision, truly blurs the boundary between design and art. Ditzel’s career was distinguished by an astonishing amount of experimentation with materials and forms, time and again reinventing her style. 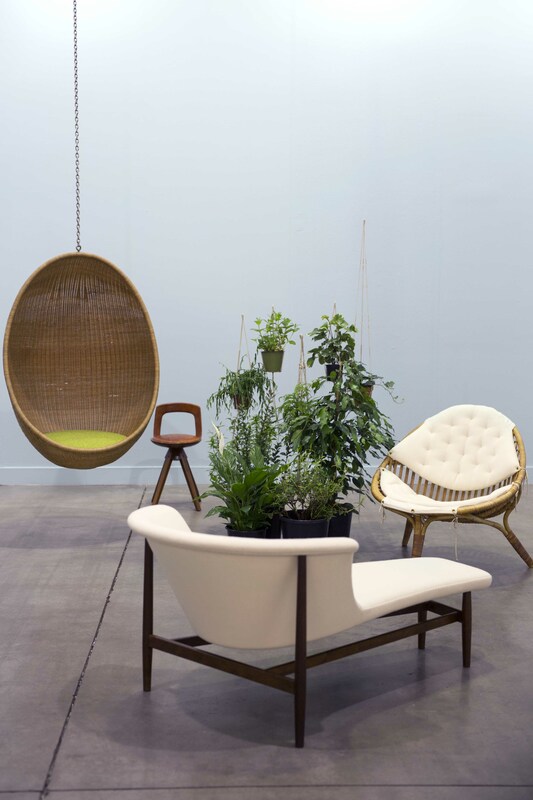 The iconic Hanging Egg Chair is an example of her mastery of natural materials, inspired by everyday household needs, for the creation of a comfortable, intimate spaces. 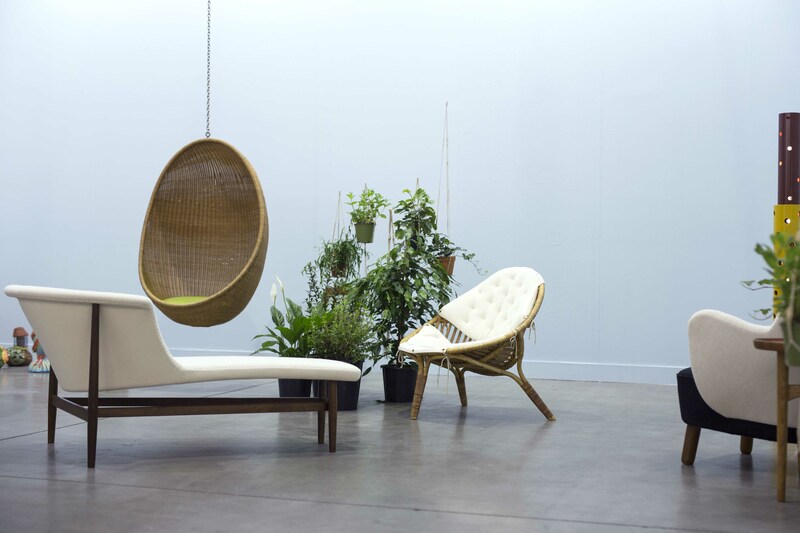 She used rattan to create a nest-like pod that broke the distinction between inside and outside, being equally suited to hang from a tree branch as from the living room ceiling. The chair’s suspension was also a space-saving mechanism for residents of small modern apartments, who wanted to refashion their abodes with alternative mechanisms for creating privacy. The Hanging Egg’s simple yet groundbreaking form is a true reinvention of the chair, as mindful of its users’ needs as it is reflective of Ditzel’s characteristic pursuit of freedom in design. Tove and Edvard Kindt-Larsens’ diminutive swivel stool, which was designed for cabinetmaker Thorald Madsen and debuted at the 1957 Cabinetmakers’ Guild Exhibition, accompanies the Ditzel pieces. With its minimalistic, almost technical look, it fits as well in a living room as at a drafting table. Indeed, in the ’57 installation it was shown at a work desk within a living room—a blurring of the boundaries between leisure and work spaces. Like Ditzel, the Kindt-Larsens were responding to the limitations of cramped apartments by making multitasking, compact furniture. Tailored to middle-class needs, their stool’s refined design nevertheless piqued the interest, upon her visit to the Exhibition, of Denmark’s Queen Ingrid, who bought one for herself. The stool is thus an example of Danish Modern’s innovations getting elevated to the status of a tradition: the democratizing project of making quality furniture for the modern citizen was supported by the country’s most traditional institution—the royal family—whose endorsement rendered certain individual pieces, like Kindt-Larsens’ swivel stool, iconic. Finn Juhl’s 46 sofa, designed for the small upholstery workshop of Carl Brørup, but produced by Bovirke, is often cited as an example of the impact Finn’s affinity for modern art had on his furniture design. Picasso, Hans Arp, and the Danish artist Erik Thommesen were all of interest to him, but the 46 sofa’s organic lines and curves recall perhaps above all Henry Moore’s undulating reclining figures. Juhl’s interest in art is reflected also in his design process, which was guided by a holistic approach to aesthetic form, and resisted the utilitarian and systematized use of measurement popularized by the Functionalist movement of his time. In the 46 sofa, the result of this process is that of a dynamic form which seems to softly morph as one moves around it, and exudes a warmth of character that emanates directly from the personality who gave it shape. Displayed together with the 46 sofa is Juhl’s Judas Table (1948), crafted by cabinetmaker Niels Vodder. Monumental in character, the Judas is famous for the 30 inlays of sterling silver that dot its Brazilian rosewood surface—the same number of silver pieces for which Judas agreed to betray Jesus according to the Gospel of Matthew—creating an enigmatic pattern that has been said to resemble a star chart. The table’s current name stuck to it independently of Juhl’s original intention, lending it an ominous gravity, conjuring associations of treachery, sacrifice and, of course, the Last Supper. Nothing about the table’s actual story bears these out: Finn Juhl designed it for his own home, and the silver-pieces’ number and positioning actually indicate the number and placement of people who can sit at the table. The design is an example of an artistic originality that outdoes itself, offering its audience more opportunities for creating meaning than the designer himself could have initially envisioned. Nine ceramic vases by Berlin-based artist Nico Ihlein, made between 2013 and 2016, dot the booth. Given entirely over to form, the vases’ function as vases is rendered practically irrelevant. Their literal emptiness contains metaphorical substance, however, with each work possessing an eccentric character—melancholic, flamboyant, degraded, dynamic. Ihlein draws inspiration for his practice from the excessive nature of fashion and interior design, and from a multitude of diverse sources and references, from Arcimboldo to airport art; Mapplethorpe sculptures to Victorian Fancy Dresses; and Yves Saint Laurent perfume boxes to Tupperware (to name but a few). What results is often vaguely recognizable cultural signifiers encrusted onto disturbingly luscious, organic forms that appeal to their viewer’s memory while remaining distinctly alien. They evoke many associations: poisonous mushrooms, candy melting in the sun, and dusty curtains in a Baroque sitting room all come to mind. 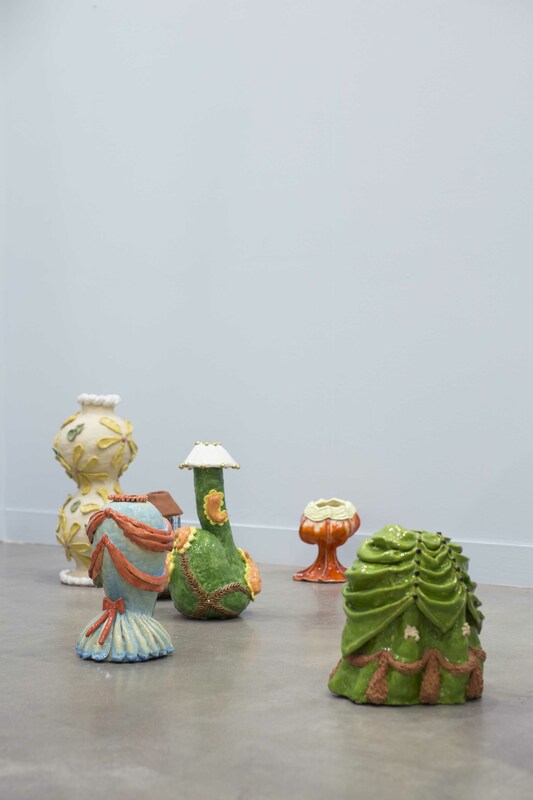 Actually, any attempt to describe Ihlein’s vases—either together or singly—results in a seemingly inexhaustible proliferation of comparisons, as they elicit from the viewer’s imagination the same kind of copiousness that they themselves exude.